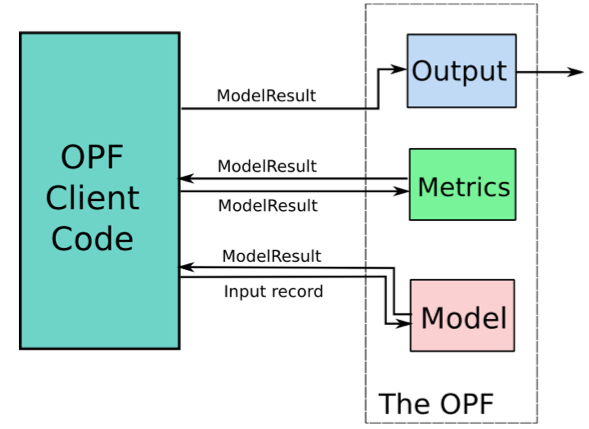 The OPF does not create models. It is up to the client code to figure out how many models to run, and to instantiate the correct types of models. Constructor for the model. Must take an InferenceType value (see below). A model’s __init__() method should always call the __init__() method of the superclass. Data structures related to inference elements are located in Inference Utilities. This association is used to compute metrics and to determine which parts of the input to write to output. For example, to compute error, the value of “prediction” will be compared to the value of SensorInput.dataRow, and the value of “classification” will be compared to value of SensorInput.category. This means that we are calculating the average absolute error (“aae”) on the multiStepBest inference element, for the entry that corresponds to the field foo, and with an optional parameter window set to 200. The modules that actually calculate metrics are located in Available Metrics. They all inherit the abstract base class MetricsIface, and they must define the following methods. addInstance(prediction, groundTruth, record): This is the method where a new inference-groundTruth pair is passed to the metric. Additionally, the raw input record is also passed to the metric calculator. The module is responsible for calculating the metric and storing the relevant information here. Types: Different inference value types are handled differently. The OPF distinguishes between 3 types: lists, dicts, and other. 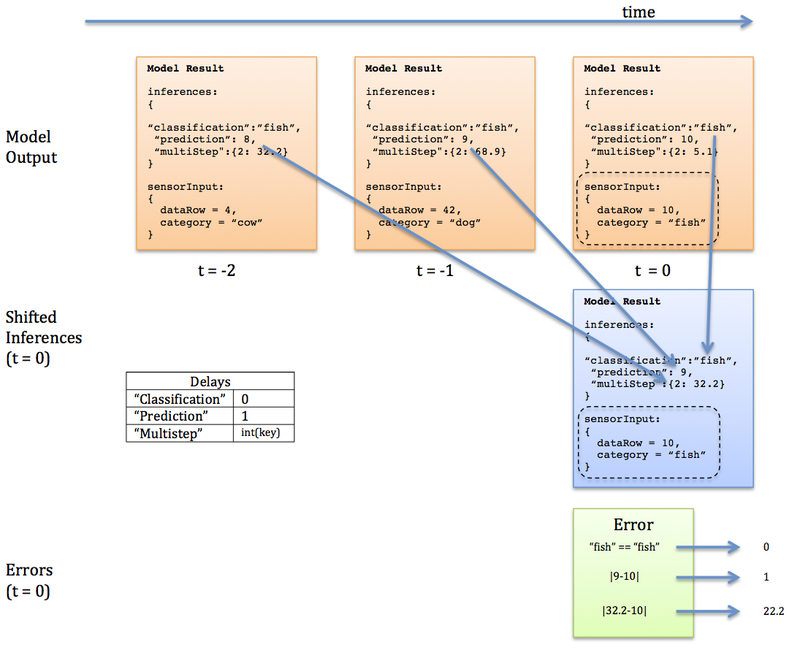 Lists are assumed to be associated with the model’s getFieldInfo output. An individual element is always output as a string, no matter it’s actual type. Dicts are the most general, and separate columns are created for each key. Each entry in a dictionary is output as a string, no matter its type.